The Arc of Blair County has a Scholarship Fund available. The fund was established to provide support individuals with developmental disabilities, their families, and Arc volunteers to attend out of area camps, trainings, workshops, conferences and other educational opportunities. Hotel fees, mileage reimbursement, registration fees or purchases for material and resources such as books are examples of how the scholarship money may be used. A very easy to complete one-page application form needs to be turned into The Arc and then reviewed by a scholarship committee. Registrations are taken via this Arc website at the link at the top of the page. However, once in a blue moon we discover someone who prefers to register manually. To attend a training or conference hosted by The Arc of Blair County click on the form to the right. This will allow you to download a printable registration form. 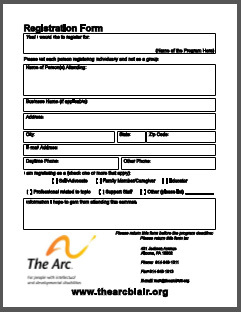 Please return the completed form to the Arc by registration date listed.